Atlas Copco Underground Rock Excavation and Remote Control Technologies (RCT) unite to offer mobile equipment automation solutions for the underground mining industry. The world of underground mining is becoming increasingly challenging. Issues associated with deeper orebodies, increasing costs and the drive for greater social responsibility continue to pressure the viability of many operations. In response to this, Atlas Copco and RCT have agreed to team up to provide a comprehensive range of automation solutions that will deliver on the demand for safe, productive mining. Atlas Copco and RCT are two leading names in the mining industry and each offer a range of automation solutions for increasing safety and productivity for underground mobile equipment. While Atlas Copco’s solutions are focused mainly on machines that utilize the well-known RCS control system, RCT provide solutions that are a perfect match for some of the older generation Atlas Copco products that remain popular workhorses of the industry. By combining expertise and solutions in this way, Atlas Copco and RCT can offer a broad range of remote control and guidance systems for the majority of Atlas Copco’s underground machine portfolio. According to Phil Goode, Senior Business Development Manager for RCT, ”The intention is that Atlas Copco and RCT will provide a united front in addressing any safety or productivity issues that a customer may be experiencing. They will have access to the expertise of both organizations to ensure an automation solution can be found that meets their specific needs, no matter what type of Atlas Copco vehicles are in their fleet. We have worked successfully with Atlas Copco in the past and it is a great step forward to be able spread this cooperation further”. For further information, please contact your local Atlas Copco or RCT representative. 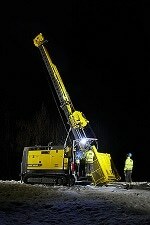 Atlas Copco Underground Rock Excavation is a division within Atlas Copco’s Mining and Rock Excavation Technique business area. It develops, manufactures, and markets a wide range of tunneling and mining equipment for various underground applications worldwide. The division focuses strongly on innovative product design and aftermarket support systems, which give added customer value. The divisional headquarters and main production center is in Örebro, Sweden. Remote Control Technologies Pty Ltd (RCT) is a wholly owned Australian company specialising in the manufacture and installation of safety and productivity products for the mining, mobile equipment, earthmoving, transport, agricultural, construction and materials handling industries. RCT have been in operation for over 40 years and has a proven history of excellence in providing customer driven safety and productivity solutions, industry leading innovations and an outstanding level of customer service.